Fineleaf mesh is a gutter guard suitable for home owners who have a problem with keeping very small leaves out of their gutters. Fineleaf mesh gutter guard will stop Jacarandas, Wattles, fine native trees leaves, annoying pollen and fine pine needles from blocking your gutters. Any gutter guard used to stop very fine leaves will need to be cleaned off on a regular basis but this type of gutter protection will effectively stop the fine leaves from entering your gutters. 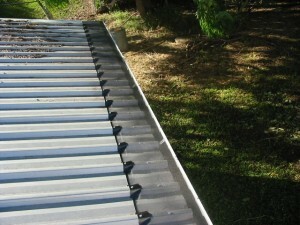 Anyone with a Jacaranda near their house will know that jacaranda leaves can cause valleys and gutters to overflow. Blocked Valleys and gutters can often even lead to ceiling damage. Stainless Steel or Aluminium Fine Leaf mesh comes in Black as standard but Fineleafmesh can be painted to match most colorbond and tile colours. Fineleaf mesh when painted is almost invisible from a distance. 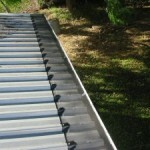 If you have fine leaves in your gutters phone Leafshield Gutter Protection on 1300 362 246 for a free quote. We have a range of gutter guards to suit any leaf type and will help you choose the right gutter protection system for your leaf and roof type. We have installed Fineleaf mesh gutter guard throughout Brisbane including : Indooroopilly, Chelmer, Ascot,Graceville and Clayfield.